The ponies are the tools of our work. We depend on them, we couldn't operate without them and it is the ponies who the children love. They do a magnificent job and bring great happiness and benefit to the children. Stuart’s Patchy joined our team in March 2019. 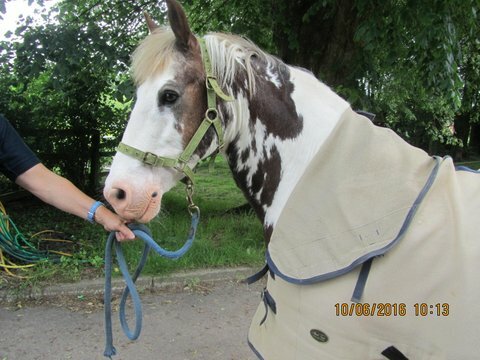 He is a 9 year old 14.3 hh piebald Irish Cob who is more used to Western Style Riding than Riding for the Disabled! He has settled really quickly into his new role and took part in several classes during his first week which is very unusual for a new pony. Stuart‘s Patchy was purchased in memory of Stuart who loved horses and gained so much pleasure from his experience with them through Riding for the Disabled. 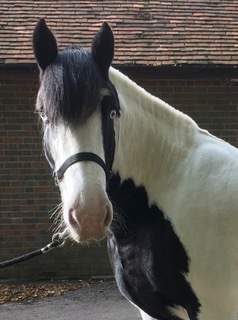 Ziggy arrived at Newbury RDA in January 2019. He is a 12hh Welsh Cross Strawberry Roan pony who is slowly being integrated into the team and should be in full work by half term. He appears to be very patient and doesn’t mind if bean bags fly past his ears on the way to an awaiting bucket! He looks much younger than he is. Genesis arrived during the October 2018 half term. She is a 15hh piebald cob aged 9. As you can see from the photograph she has two wall eyes. Genesis was an RDA pony prior to joining us. She is an ideal size for our taller riders and will be an extremely useful addition to our team. 13.2 hh dark bay cob with lots of white socks and a big blaze. Bandit, who is 10, joined us in September but has only just become a permanent member of our team of ponies. He is becoming a very popular pony with our riders and seems to enjoy life at Wyld Court. Rio a dun 14.3hh Welsh Cob joined our team at the end of July. 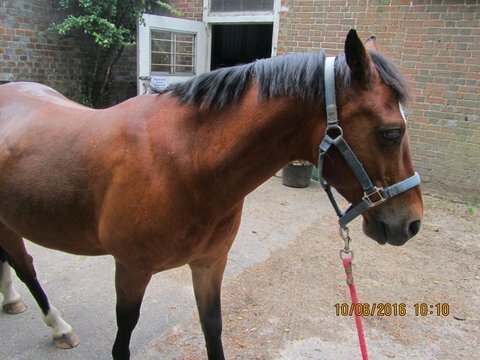 He has a lovely temperament and so far, those who have ridden him have found him very comfortable and willing. Woody is our smallest pony. He is a Dartmoor pony and exceptionally good for getting new nervous riders started. 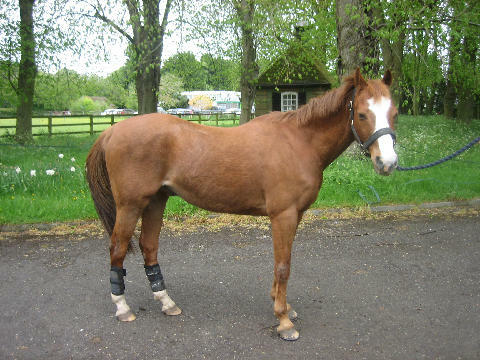 The next in size is Bungle, an ex show pony who is on loan to us. 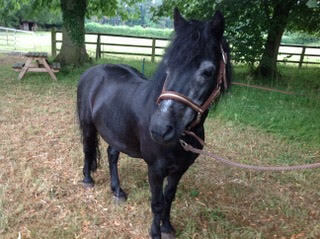 He is a very able pony, very obedient so brilliant for children to progress with their riding. He does as the children ask and never takes advantage. He has won lots of rosettes in the past. Bungle is now getting quite old, so we have to be very careful that we don't over use him. Ted, is 13.2 hh and the children love riding him. He reacts to insect bites so has to wear a special fly rug which covers most of him to prevent him from being bitten. Ted competed at the RDA Regional Show held at Wellington in the summer where he was ridden by three riders who all did very well. Ted found it all rather exciting! Before we take ponies on, we have them on trial to see if they like RDA work, fit in with our regime and the other ponies. They have to be very special horses, very well behaved, patient and kind. They are difficult to source and we are lucky to have such magnificent team. Our Stable Manager, Danielle, and our Pony Trustee, Clare, have now got a good team of ponies together. They seem to be happy and are all working well. All of Newbury RDA's horses and ponies are microchipped and freezemarked.